Lisbon is easy-going, vibrant, cosmopolitan, and best of all, affordable! The grid-like Baixa, or downtown, was laid out after the 1755 earthquake. The city’s main axis, Avenida da Liberdade, is lined with cafés and fashion chains making it a great place to lounge around and people-watch. Check out the Chiado district, the city’s most affluent quarter. With its high-end stores and elegant tearooms, Rua Garrett is a big budget shopper’s dream. Rossio Square is pretty much the focus of the city with the main attraction being Teatro Nacional. At the end of the Baixia, you’ll find PraÃƒÂ§a do Comércio. Framed by arcades and dominated by a triumphal arch, this is a wonderful place to sit, eat, and take in all the beauty that Lisbon has to offer. To fully grasp how breathtaking Lisbon truly is, visit Castelo de Sao Jorge. It’s a bit of a hike, with its steep and narrow roads, but in the end, you’ll be happy you did it. Just think of all the great photos you’ll be able to take. 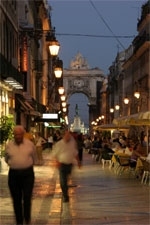 Not too far away from the main hub of downtown Lisbon is the Bairro Alto area, a haven of clubs and bars. Although it’s a bit pricey, the Docas (Docklands) district shouldn’t be overlooked. Check out all the hip clubs at Doca Santo Amaro and Doca de Alcantara. Make sure you take a nap first because the clubs start happening at around 2 a.m. and stay open until 6 a.m. Admission is usually between 5- 50 euros and that depends on the doorman. Portuguese food is delicious and inexpensive with most cafes serving basic meals for only 8 euros. Try their seafood, cheese, and pudding selection. In addition to their tasty food, their wine is so world-renown that you’ll want to bring back a bottle of Port and Maderia to the States. Lisbon is also known for it many miles of beautiful beaches. So pick up a book, your swimsuit, and maybe a glass of wine, head down to the beach and take it all in. Travel Tip: You may want to wear shorts or skirts to keep cool, but in some rural areas and religious countries it’s frowned upon to show too much skin. Make sure to check the dress code so you can pack accordingly. Get your travel questions answered at askourpros@fushionmag.com.